A quick snap of your favorite reports, with all the information you need on hand. E-mail Marketing, SMS Marketing, Facebook and LinkedIn Posts all in one location easy access. Enjoy automated lead generation based on your existing customers and leads. Easy management of leads, follow ups, e-mail integration and converting contacts to leads. Full scale customer management with multiple addresses, methods, terms and payments, all in one location. Manage Receivables, Payables, Bank balances, etc. with ease and comfort in just few clicks. stay organized and updated at all times. 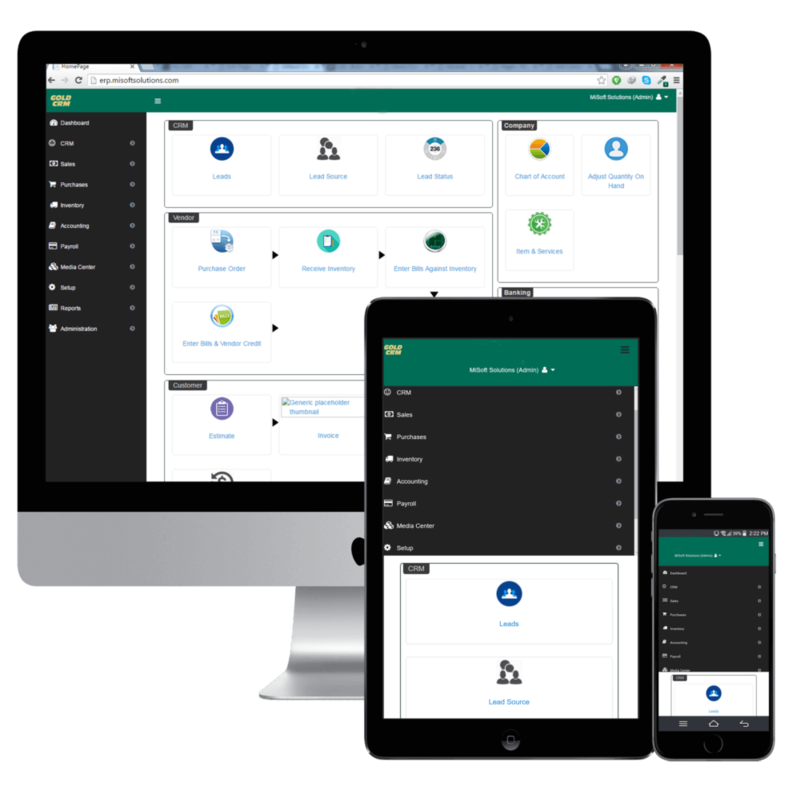 Add items or Services, manage quantities, support multiple locations, Bar code generation, and lot more features. control inventory or orders from ERP Gold as central system between your website, E-bay, Amazon, Walmart or Shopify and more. Gantt Charts, resource management and task tracking all on your fingertips. Item Assembly, production Control, Bill of Material, production costing and more. Sell from a store front or use our POS, and sync everything for your ease. Maintain repeated customers with easy management of your inventory and sales. Pull from a database of millions of businesses to find valuable sales leads in your industry, or use our Gold List feature to send you leads based on selected criteria. Enterprise level big-data toolset. One-stop marketing for all of your existing customers and leads through Email Campaigns, Facebook, Linkedin, and Twitter; Even send postcards with a click. Integrated ERP, CRM, and accounting modules give you the bigger picture. Spend less time juggling multiple software suites. Every business has some unique requirements, let us know about special features, reports, forms or may be the automation and integrations that you need to run your operation. What is an ERP Software for small business means? Enterprise resource planning (ERP) means a business process management system that allows an organization to use computer software(s) to manage business operation(s) by automating and integrating multiple tasks and functions. e.g. e-mail marketing, customer followup, invoicing, project management, inventory, HR and accounting. 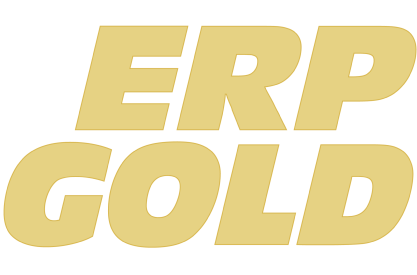 ERP Gold is a full-stack intelligent Low Cost ERP Software for Small Business, this all-in-one solution provides lead generation to profit and loss statement in one platform. Most small business run their business operations at multiple systems, either by integration or by duplicating data entries. ERP Gold’s ERP Software for Small Business brings major business operations from marketing to accounting in one platform, it is designed around a small business owner’s need(s). "Intuitive use. we can easily log in from any part of the world and access our accounts. There are links that exist between part of transaction (quote, SO, PO) that lets us easily navigate through the workload. Based on our business needs we requested changes and the company was very helpful in creating a solution for us. I would be happy to recommend it to every one"
"We were using 5 different systems to run our business operations, Now with ERP Gold we have marketing, lead generation, CRM, PO, invoicing, inventory and accounting all in one place and on top of that EG team took care of our data transfer part. Definitely a tool every small business need." “Finally, wow, I just looked at the system and love it. Very clean design, super-slick and intuitive, like how it's designed to be mobile-friendly from the ground-up, and it seems pretty feature full and robust. Looks like you've built got a really solid platform there!" 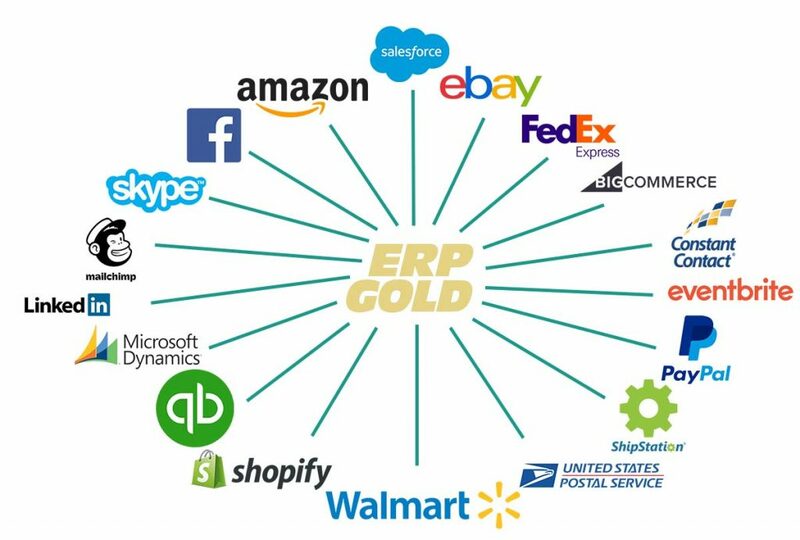 "ERP Gold is a custom built solution that perfectly caters to our needs. Finding a solution that is responsive, knowledge based and cost effective can be a tedious task to handle, but we have found ERP Gold, all that and more. ERP Gold Implementation process was quite easy and was resilient enough to be quickly adaptive of the requirement at that time, we highly recommend ERP Gold and look forward to working with it on future advancements."